Have aliens ever been here? Do they walk among us? Many have speculated on the possibility, but not everything that is possible is probable. I remember when I was a kid, me and a friend were sitting near the river and we saw something in the sky, something that neither of us had ever seen before. It was triangular in shape and made no sound, at least no sound we could hear. It wasn’t a plane, we’ve seen planes before, we’ve heard planes before, and this was no plane. Skip ahead a couple decades, and what we saw in the 70’s was probably an early prototype of a stealth aircraft. I don’t know when they officially released when they started the stealth program, but that is what we saw in the 70’s. Technically you could call it back then a UFO, because it was an unidentified flying object, but it definitely was not alien. We, of course, never told anyone what we saw, because we didn’t think anyone would believe us, just a couple kids yankin’ people’s chains. Realistically it’s not very probable that any ship would come here. A ship would have to be built that could travel over several generations without major incident. And you can forget about travelling at the speed of light, because even if we could build a ship that could travel that fast without breaking apart, if something even the size as a grain of sand or smaller hit it, it would destroy the ship upon impact. Science says that an atom, just an atom, travelling at the speed of light would destroy the Earth upon impact. Now imagine a car travelling down a straight flat road at 2000mph without hitting anything, not even a bug. Now imagine that same car travelling down that same road doing 186,000 miles per second. The chances that us or an alien species could construct something able to travel at that speed, without being completely destroyed long before it ever reached it’s destination is highly improbable. So that leaves slow, several generation travel. 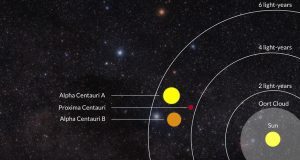 The next nearest sun is Alpha Centauri B which by today’s speed standards would take over 70,000 years to reach, which means we would have to construct a ship that could survive over 70.000 years. Again, highly improbable. And I am one of those people who believe that in this vast Universe we cannot reasonably think we are the only living intelligent species. But, aliens have not been here, and chances are we will never meet. 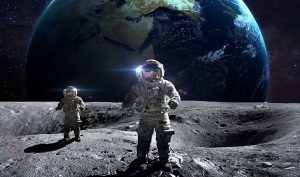 Space travel as we know it today is not a viable long term solution. We would need something like Stargate, or a worm hole, that gets us immediately from point A to point B.